Antique French metallic silver textured ATG custom ribbons pillow. Silver twisted cord details and silver silk backing. 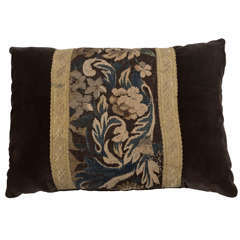 Decorative pillow handcrafted and designed in the USA. Closure by stitch (no zipper closure) with custom-made pillow insert. Size: 16 x 21 x 6. 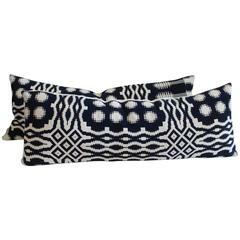 These finely woven coverlet pillows are in great condition and have natural raw silk backings. The inserts are down and feather fill. Sold as a pair. 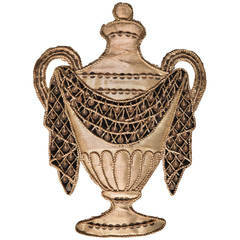 French urn textile for use in applique. Constructed of woven silver thread with metal sequins and twisted ropes of silver thread. 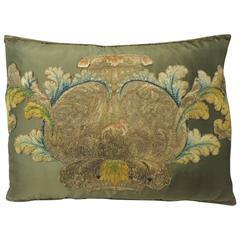 Very fine work in excellent condition, circa 1830. 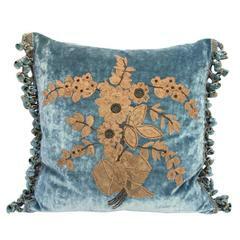 19th century French metallic &amp; lace appliquéd flowers on silk velvet background with linen back and silk tassel fringe at sides. Down filled insert. Sewn shut.